Our Labcoat is adjustable, unlike any other labcoat! Finally! A labcoat that adjusts to your every whim! The hidden interior back drawstring allows you to adjust your waistline to a snug, hugging fit or a more roomier,relaxed fit. 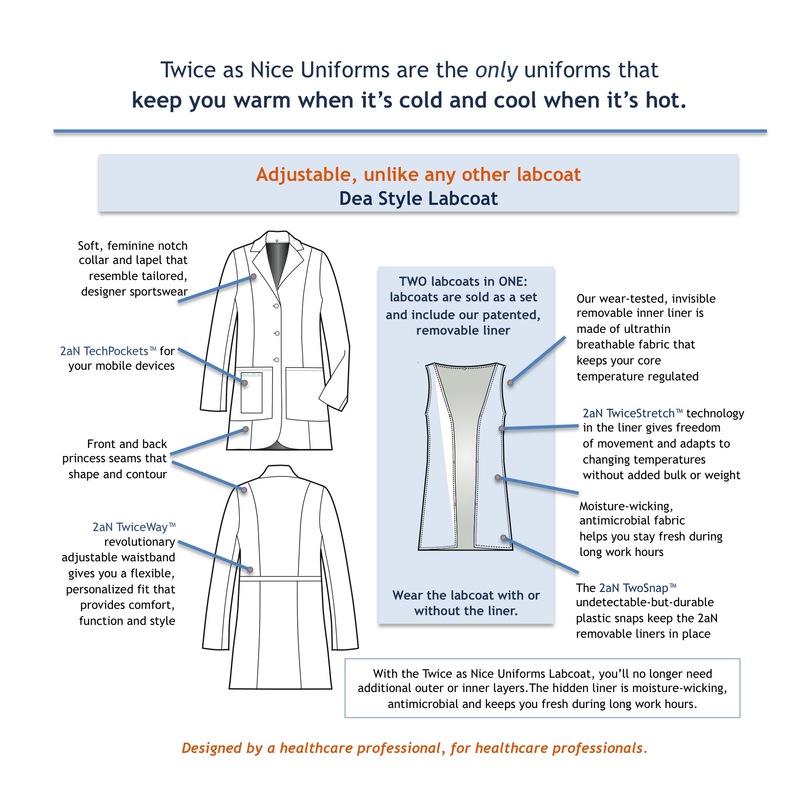 The labcoat comes as a set – the outer jacket plus a our patented, antimicrobial removable liner – eliminating the need to purchase or the hassle of added layers that limit your range of motion. Our customers LOVE the fabric and drape of our labcoat. The soft, feminine notch collar and lapel resemble tailored, designer sportwear. We inist on more stitches per inch (SPI), which means you get the benefit of softer fabric that is comfortable yet durable and retains its shape. The modern, longer length is flattering and has clean lines. And, our fabrics are of a higher quality than the typical labcoat, with two-way stretch that moves with you. The labcoat launders easily without the need for ironing. Our labcoats and scrubs are made from fabric that is highly resistant to stains from blood and chlorhexidine.